Pictured from left: Scott Wiegers,Lead Pressman, Gregory Greenwald,President, Scarab Printing Artsand Tim Meihls, Central Region Sales Manager, Brandtjen & Kluge, LLC. Customer base: Travel Agencies, Home Builders, Defense Contractors, Beer Manufacturers, Golf Course Equipment Manufacturers, Incentive Travel Companies, Accountants, Attorneys, School Districts, Museums, Non-Profit Agencies, Marketing Agencies, and other Printers. 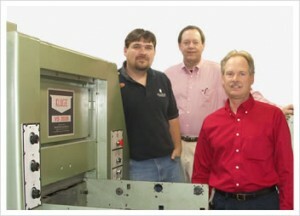 Scarab Printing Arts produces over 50% of its work on Kluge presses. Customers appreciate the pizazz that Kluge equipment brings to their work. Brandtjen & Kluge, LLC. now offers acomplete new line of Vertical Foil Stamping, Embossing, Diecutting & Stripping Presses to accommodate sheet sizes up to 51″ x 37″. Visit the Product Area to learn more about these products.